Are you sick of the average look of your bathroom? Spice things up with funky interior design. From the floor to the ceiling, by making certain updates, your lavatory will be something to talk about. If the linoleum on your bathroom's floor is past its prime, you might consider replacing it with something a little more vivacious. Tile is available in a plethora of colors and styles. Instead of going with a traditional white or pale hue, perhaps consider a deep navy or crimson for your floor. You can also create elaborate patterns from these pieces that will really catch the eye. For a shower's base or the surface of a countertop, consider mosaic tiles. Installing these adds a bright splash to your facilities. Apply the dazzling small squares to accent the space, perhaps choosing a pattern with red, orange, white and brown pieces. For the wall space, choose colors that are out of the ordinary. Paint over white surfaces with red, or maybe even try an eye-popping green to really make your facilities different. If you want something more elaborate, line your walls with patterned wallpaper instead. It's easy to give a space pizzazz with the right decor. Houzz offers a few tips for establishing a little bit of funk in your bathroom by adding a few items. One of these ideas is to put "real" furniture in the room. Instead of limiting your facilities to the necessary toilet and sink, why not add a wooden chair or a small coffee table? 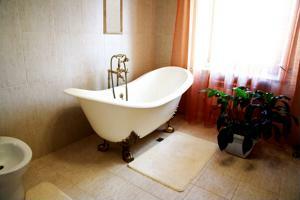 If you have the space, these sorts of additions will make your bathroom comfortable and unique. You might also put additional wall shelves in your bathroom and line them with funky odds and ends, like leather-bound books or a lava lamp. If you want to add true distinction to the facilities, there is a toilet fixture on the market that may do the trick. NightGlow Toilet Seats, manufactured in Ontario, are the classic white during daylight hours, but as soon as the lights are out, the seat and lid glow bright blue. Not only will this give your bathroom a real conversation piece, but it may also be helpful to lavatory users in the middle of the night. By adding atypical features like these, you'll give your bathroom just the right amount of jazz to make it something special.